I adore the Pioneer Woman. Many love her while some dislike her (I`m not sure why, though). Her dishes are wonderful--well, from the ones I`ve tried. If you guys want to make the whole dish, I encourage it! I was intrigued by this recipe because it was so simple and I love simple things. :) It`s not the typical cobble stone looking cobblers either, which made me even more interested. I tend to like an even ratio of bread/crust with fruit. However, most cobblers are all fruit and some crusts on top. Anyways, some of my family visited on Sunday and we went to Disneyland and California Adventure, so I`m pooped! My first summer session is over (got an A!) and I`m starting another class and have some work to catch up on! In the meantime, make this while berries are in abundance! I suggest make the original recipe to make more servings, since I know I definitely wanted more when I finished this! 3. Whisk together 1/2 cup sugar, flour, baking powder, and salt in a medium bowl. 4. Add and combine the milk. 5. Then, add the melted butter and mix until everything is incorporated. 6. 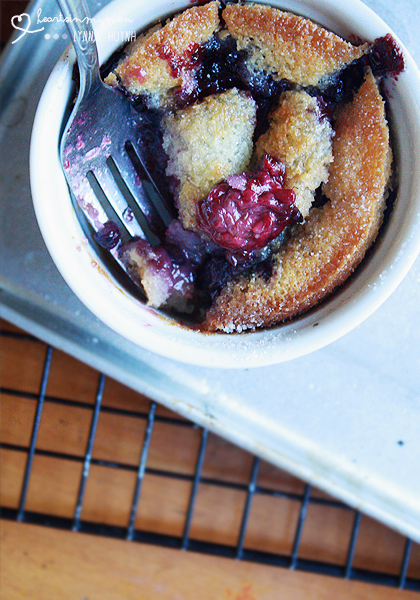 Divide the batter between the ramekins and drop in a few blackberries in each ramekin. 7. Sprinkle 1/2 teaspoon of the sugar on top of each ramekin. 8. Bake in the oven for about 1 hour until edges are golden. With 10 minutes left, add the other 1/2 teaspoon of sugar on top of each ramekin. Remove and place on cooling rack to cool for about 15 minutes before serving. I'm making a crisp tonight for my family too :) Cute little individual cups! I need to dig out mine, I chipped the 6th one of the set....oops! 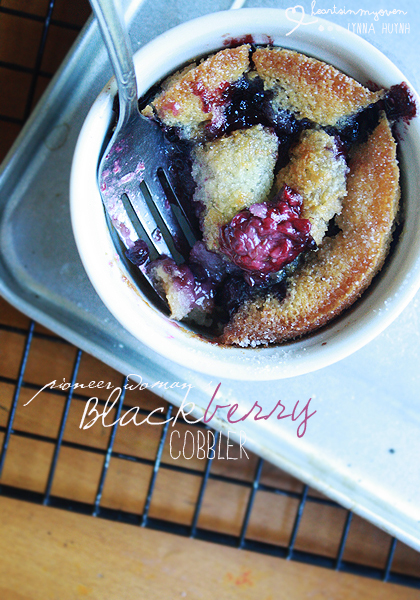 And love the blackberries in your cobbler, its going to be so sad when they're out of season! It`ll give you dessert a more vintage look! Haha. I`m going to be sad when all the berries go out of season! I'm a huge fan of PW too! You did such a beautiful job on this crisp...just lovely! I've tried her cinnamon rolls and love it!! This looks like a great recipe, too! Oh really? I really want to! But, the serving size is way too much for me to handle! Yeah I hear about bad things about PW, but who cares as long as she makes great recipes! :D Hmm this one looks nice. I need to get blackberries and make this. This one is very easy enough for me to bake! I know right? I love her writing on her blog and I love her recipes! That's what I love. :) Oh, it`s super easy. I suggest making the whole/original recipe though, since this might be too little for your family!